The Colombian Police underwent a restructuring process (see new organizational chart here according to Decree No. Estructura Orgánica - Decreto 216 de 2010. There are Metropolitan Police Commands in the eight main cities of the country: Bogota, Medellin, Cali, Barranquilla, Cartagena, Cucuta, Pereira and Bucaramanga. Each Metropolitan Police Command has its own flag. 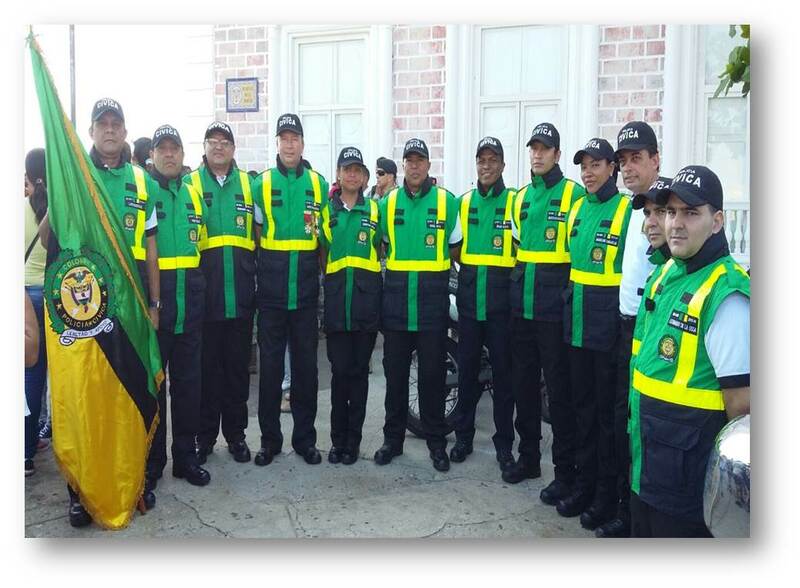 Departamento de Policía (Police Department): There are Police Departments in each of the 32 Departments of the country and an additional one for a specific subregion of the Department of Antioquia called Urabá. Each Police Department has its own flag. There have been recent chagnes in the Colombian Police lately. The current Minister of Defense (Juan Manuel Santos) has announced the creation of a New Directorate. It will be called Dirección Nacional de Carabineros (Carabineros National Directorate) and it will be included in the OPERATIONAL category of Directorates. This change means that an update will be made to the Corps that take much of the armed action on the Police which are the Carabineros. The flag is horizontaly divided flag according profesor Restrepo Uribe and by several other sources. The discussion agrees much with the flags reported in Lupant's book [lup93] page 57. - Dios y Patria (= God and Country). The flag is plain; however most of the times it has the Police Coat of Arms in order not to confuse it with other Colombian flags that have the same color pattern (like the flag of the Department of Antioquia, Department of Vaupes or even the City of Medellin. According to www.esbol.edu.co, the flag is plain white over green. Coat of Arms at the same page. 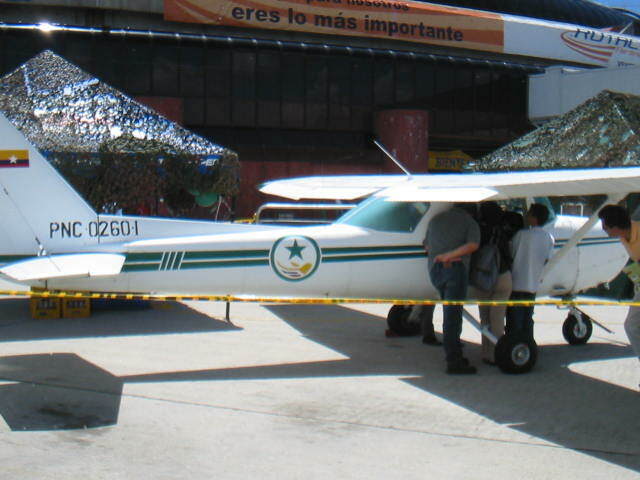 In a visit to an Air Show held in Colombia in mid-June 2004, I came across this particular aircraft. It seems to be a T-41, operated by the Policía Nacional Colombiana (Colombian National Police). Its s/n is also very particular (PNC 0260-I, the "I" standing for "Instrcucción", or Instruction in English, meaning it was for training). The roundel is a dark green ring containing a large dark-green star over a stylized bird in the colors of the Colombian flag. I saw this Pennant on the online edition of the REVISTA PODER magazine, published on August 9, 2008. I believe it is the Colombian National Police Director General's Pennat. I believe the Pennant reads DIRPONAL (Director Policía Nacional), but I am not sure. This is a Police Rank Pennant feature in the this picture. This rank Pennant is the rank of Mayor (Major) based on the rank chart of the Police website here. Thus we can deduce that all other rank pennants in the Police are based on the same pattern, the only thing changing is the image of the actual rank, the color scheme is the same. This is Police Captain rank pennant based on a picture here. This picture shows the rank pennant of the Director of the SEJIM school. On the left side of the picture one can see the obverse a white rectangular pennant, same size as Army rank pennants with a white thick outline, then green background with the three golden bars in the middle which represent the rank of Captain as shown in their official website. Flag and Coat of Arms at: www.policia.gov.co. Motto is "Thinks About You". 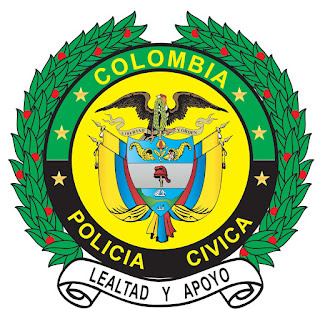 The Colombian National Police is organized on the national level based on the geographical division of the country (that is Departments and main Metropolitan Areas when referring to the main cities). It is comprised of a "Comando de Departamento de Policía" (or Police Department Command, which is the Police organization established in each of the 32 Departments of Colombia). Plus, the Police has three Metropolitan Commands for the three main cities: Bogota, Medellin and Cali. All Police Department Command of the 32 Departments of Colombia have same flags besides the name of the department. The first official flag is the Colombian tricolour, charged with the Colombian coat of arms over a white star, and a maroon circle around reading on top POLICIA NACIONAL, and on the bottom DEPTO. (abbreviation for DEPARTAMENTO) * POL (abbreviation for POLICIA) and the name of the Department. The second official flag is the Colombian National Police flag, charged with the Colombian coat of arms over a white star, and a maroon circle around reading on top POLICIA NACIONAL, and on the bottom DEPTO. (abbreviation for DEPARTAMENTO) * POL (abbreviation for POLICIA) and the name of the Department. Regarding the flags of the three Main cities Metropolitan Commands, I have not seen them, but I do know they exist. Below are examples of the two official flags from two departments. Note that the inscription in and border of the maroon ring are gold on the Colombian tricolor flag and and silver on the white/green bicolor. I saw a Police patrol that belongs to the Policía Metropolitana del Valle de Aburrá (Aburrá Valley Metropolitan Police) which is one of the three Comandos de Policía Metropolitana (Metropolitan Police Commands). The flag of the Comando de Policía Metropolitana del Valle de Aburrá has the same scheme as the Comando Departamental with the only difference being on the Coat of Arms, the lower part of the red circle having the words METROPOLITANA VALLE DE ABURRA. Its flag is the coat of arms in the middle of a horizontal flag, which in turn is horizontally divided into as seen here: https://www.policia.gov.co/sites/default/files/civica_foto.jpg (source: https://www.policia.gov.co/programas-sociales/civica-mayores). It follows the same pattern as the "General Santander Police Cadet School (variant)", adding a black line in the middle dividing the green (top) and yellow (bottom). The flag of the ACORPOL (Asociación Colombiana de Oficiales en Retiro de la Policía, or Colombian Asociation of Retired Police Officers). The information is based on a magazine, published in March, 2006, by this asociacion, in which it portrays the flag, the Coat of Arms and a proposal for a new Coat of Arms. The flag has the same bicolor color scheme as the General Santander Police Cadet School plus the Coat of Arms on the middle. The green color stands for hope and the yellow color stands for richness. This was a proposal sent in August 1985 and published my the Association's magazine, made by Lt. Col. (r) Alberto Bernal García (deceased), of the ACORPOL office in the Departmento of Valle, making a call to upgrade not only the Coat of Arms but also the anthem and the flag. The proposal was published in the magazine Carta Policial, Edition No. 49, August-September issue of 1985.